Description: From 2 to 8 inches tall. 8 to 10 petaled flower. 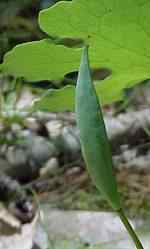 Usually rounded and variously lobed leaf is folded around the flowering stalk when first appearing. The under ground stem contains the "blood" referred to in the name. 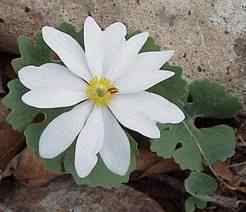 The plant is poisonous if eaten and a skin irritant to some. Was used for medicine as an extract. It is said that the American Indian used a dye made from the juice to color there garments and handiwork also used it as war paint.